The object at the upper left is a cast iron dice paperweight. There are two green moveable dice between two scottie dogs. Made by Hubley and marked #393 on the bottom. To my surprise, these are very desirable, went for $491.78 on eBay in 1998!.... ....... .... The object at the upper right is an old dice canceller. Marked as made by "MPC" (that's the Mercury Product Company, Chicago)...... ..... ........ The item at the lower left is an original metal die of the old H. C. Edwards Co., NYC, which was used to stamp "New Frontier" and the logo on dice. That is the famous Las Vegas casino. Above is pictured a Dice Edger made by Mercury Products Co, and the logo of the company, taken from the same dice edger. (I don't own the item.) 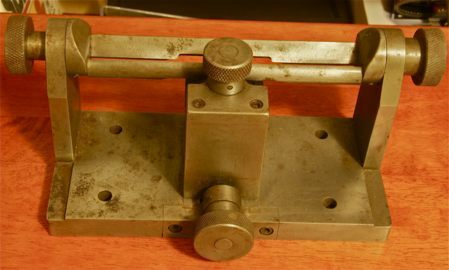 I am told that these Dice Edgers were used to shave dice to gaff them: "Used with a Whip Cup, and by shaking the cup in a special way, the dice can be forced to turn certain numbers with somewhat of a certainty. It's not 100%, but for dice hustlers, they didn't want 100% as it would bring too much attention to them, and the dice and cup they were using. The dice cup also has to be gaffed, usually with whip cord, and without a lip on the rim of the cup (so the dice don't trip leaving the cup)." I am told by the owner of the item, who provided the description and two pictures, that these Dice Edgers are extremely rare items. All of these are glass advertising paperweights with moveable dice inside.... .... .... I have a number of excess ones like those at the upper left and upper right that I would sell for about $25.00-$35.00 each (the El Rancho one is not for sale). They were used as advertising business gifts. Incidentally, the one at the top middle is from the famous El Rancho Vegas, Las Vegas, c. 1940's. It was the first major casino-hotel on the Las Vegas Strip.... ........ ..... The six on the bottom are all from the turn of the century -- have a 1903 patent date on the bottom of most of them. The one with the man's head pictured is from a place in Brooklyn NY: Day Star Hall at 3rd Ave and 54th Street. The one at the lower right says on it "World's Fair, 1915, Wells Fargo Express Co."